» Obituary: PHILIP R. CRAIG (1933-2007). Obituary: PHILIP R. CRAIG (1933-2007). Strike, will be out next November. A short autobiography of Mr. Craig can be found at www.philiprcraig.com. It will be for his books that he will be remembered by his readers, however. And from his books it was easy to understand what kind of person the author was. In their own way, in some imprecise fashion, of course, they are also the core of his biography. Like clockwork, every year from 1989 to the present except one, another excursion to Martha’s Vineyard and another case for former Boston cop J. W. “Jeff” Jackson and his wife Zee (nee Madieras), whom he married early in the series. After falling in love with the island, Jackson settled down to a life of fishing and occasional private investigation, often bringing him and Zee into considerable personal danger. It all started with a bluefish blitz at Metcalf’s Hole on South Beach. It was early summer and the bluefish were everywhere. After hitting the yard sales, Zee and I had taken a lunch out to Pocha Pond, on a beautiful, sunny Saturday morning. I had unfolded the old bedspread I use for a beach blanket, and while Zee lay on it in the lee of the tall rushes that grow there and read, I waded out for some chowder quahogs. For some reason, Pocha Pond doesn’t seem to have any small quahogs, only big ones. How they make the jump from teeny seed to chowder size with no intervening steps is a mystery to me, although the Great Quahog God probably understands it perfectly. After I had my small basket full, I waded back to shore, and ogled Zee, who looked splendid in her wee bikini. I leaned down. She tossed her book, and pulled me down on top of her. I was wet and cool, and she was warm and dry. Pretty soon we were both warm and wet. Zee and I got married at noon on July 13, a date artfully chosen by me in the hope that since it was my birthday, one of the four dates I usually remembered — the Others being New Year’s Day, Christmas, and the Fourth of July — I had a fighting chance of recollecting my anniversary in the future. It was a beautiful Martha’s Vineyard day, with a warm sun in a cloudless sky, and a gentle north wind to keep things comfortable for all of us who had abandoned our summer shorts and had dressed up for the occasion. There were people with regular cameras and video cameras moving around shooting pictures. Apparently we were going to get the whole thing on record. There was an odd combination of sophistication and innocence about the girl, and, being just about old enough to be her father, I tried to imagine what it would be like to watch other people fish and not know how to do it myself. But I had been fishing as long as I could remember, thanks to my own father, who had gotten a rod into my hands before I could read. “You want to give it a try?” I asked. I got my spare rod off the roof rack and put a Ballistic Missile on the leader. We went down to the water, and I showed her how to throw the bail on her reel, to hook the line on her trigger finger, to take the rod straight back, and to bring it straight forward, releasing the line at about a 45-degree angle to the horizon. Then I made a couple of casts, showing her how it was done, and gave her the rod. “Okay.” She threw the bail, hooked the line with her finger, and took the rod back. Her first cast went into the surf right at her feet. * Death in Vineyard Waters (n.) Avon 2003; originally published as The Woman Who Walked Into the Sea (Scribner, 1991). Brady Coyne is a Boston attorney who has had numerous cases to solve on his own. Both the authors and their characters, as it turns out, are old fishing buddies, and it came as no surprise when readers found them respectively writing and solving murders together. [UPDATE] Later the same day. A lengthy personal tribute by Bill Tapply to his friend and collaborator, Philip R. Craig, is online here. Our hearts go out to Shirley and his family. Phil appeared on our TV program in March. A great man and a wonderful writer. He will be missed. I was stunned to hear Philip Craig has died. I have every one of his books (including Gate of Ivory), plus the cookbook. I met him and Shirley in the mid-’90s, and they graciously invited me into their home for an afternoon of good conversation. I had met him a few days before that on the shore of Sengekontacket Pond, where he was putting in his boat, and I walked up to him and introduced myself and said that I had been up to 2 a.m. the night before reading his latest book. He was pleased. I am very saddened at the loss of Mr. Craig. He was a bright spot in mystery genre world and made the Vineyard so special. I just heard the news about Professor Phil Craig and am feeling at a loss for words. Shirley and Phil took a group of Wheelock college students every year and showed them Medieval England. I was lucky enough to be included on one trip. His jovial laugh, his famous sayings, “Mind the Gap!”, her patience with his driving, will never be forgotten. Phil Craig gave me a wonderful piece of advice, “If you want it, buy it, then you have no regrets later.” My heart goes out to Shirley and their family. I am delighted to see such a fond and on-target remembrance of my friend Phil Craig here, and to read these heartfelt responses. His unexpected departure has left holes in many hearts. I am pleased to have an autographed copy of his cookbook, and was hoping to meet him at the Book Expo this weekend. I’ve read all his books, and they gave me many hours of pleasure. My condolences to his family. I am great saddened by the death of Mr. Craig. I love his books and, just last evening, ordered his cookbook. I was investigating the possibility that William Tapply and Philip Craig were the same individual. Is this true? Unfortunately I am just becoming aware of Mr. Craig’s work. It is bizarre how I have become aware of it but I am sure that his works will become part of my “must” reading list. Reminds me of my summer reading list at Roxbury Latin School. Now that our six children are through the college experience, now it is my time to enjoy the enjoyable. We have property across the Sound in Falmouth so it will have extra meaning. Thank God for such a special person. I am shocked to hear the unfortunate news of Philip’s recent passing. I have been working on a project for my english class since last October focused solely on his novel, A Beautiful Place to Die. I just came across the news about ten minutes ago as I was finishing my final corrections on the paper. His writing was phenomonal and although I never had the pleasure of meeting him, I know he was a great person. My heart goes out to his family. I just bought one of his books (the first of his that I’ve read) and have been enjoying it. Out of my need to know more I looked him up online only to find he has passed on from this world. I’m saddened that this world has lost such a great author and (from what I’ve been reading about him) a great man. I look forward to reading the rest of his novels, but will do so with a heavy heart knowing he is gone. My heart goes out to Mr. Craig’s family. I always looked forward to new books by him. I lived on the Vineyard for 2 years and could relate. I am very excited to hear about Delish and will be looking to buy this book very soon! I was on a Tauck Tour visiting New England. The Tour Director said they have a local celebrity who wrote Mysteries. I bought 3 while I was on Martha’s Vineyard. I am from Point Pleasant NJ where we also did a lot of fishing, crabbing etc. We also had a huge influx of tourists during the summer, and in the winter we enjoyed the the peace and quiet of the resort. Although I have been in California most of my life, reading the Philip Craig mysteries brought back a lot of fond memories. I have all his books and will get the Cook Book. We will miss him and his wonderful mysteries. Each summer I like to reread an author’s works. Last year it was William Tappley’s mysteries (including those co-authored with Philip Craig). This summer it was to be Agatha Christie’s mysteries. I will now change course in honor of my Favorite Author and reread Philip Craig’s most excellent J. W. mysteries. In summer 2006, I met Philip Craig at a book signing in Sandwich MA and thoroughly enjoyed talking with him. I had left guests back home with my husband, insisting that there was somewhere I really needed to go for a few hours..!! I’m so glad that I did. J.W. and Philip will be missed – the entire series is simply ‘delish’..!! I was saddened to hear of Phil’s passing when I happened to read it online just two days ago. I’ve enjoyed reading his J. W. Jackson books every summer. To his devoted family and friends, please accept my sincere sympathy. Although I never met Phil, he was always kind enough to answer my emails. I had hoped to meet him one day, perhaps in Ocean State Job Lot, an establishment we both admitted going to. I will treasure the words we swapped through emails and will fondly remember Phil every time I see Martha’s Vineyard. God bless and keep his family. I regret that I was not able to make it to the service. I live in the Philadelphia area and first read his books when I picked one up at a university book store. I was immediately hooked and started to crave bluefish and martinis, both of which I had never tasted before. Although I am not fond of martinis on this day I made some bluefish salad, not quite pate but quite good. Instead of martinis I accompanied it with Bailey’s Irish Cream. Not a bad combination! Since I have read all of Mr. Craig’s books I spent this weekend reading the next best thing: Bill Tapply books. As long as we have Mr. Craig’s books, we continue to have him with us. My thoughts and prayers go out to all of his family, friends and readers. He was one in a million. A toast … La’chaim … and how we deal with it. My family and I have been going to Martha’s Vineyard on vacation for the past 29 years. We fell in love with it. Shame on me, as I have just learned of Mr. Craig’s Mystery books. We were in Border’s and I noted “Dead in Vineyard Sand”, which I just purchased. I looked on-line and was saddened to see that Mr. Craig had passed on. I am a huge Agatha Christie fan having read all of her novels, many more than once. I now look forward to reading each and every one of Mr. Craig’s novels, especially since they are associated with Martha’s Vineyard. Our thoughts and condolences to the Craig family. I look forward to the enjoyment he will be providing to my wife and I with his writings. I first met JW when I lived in Massachusetts and vacationed on the Cape. Being Portuguese as Zee was, I decided to take up target shooting once I relocated to California. As prolific as he was, his books couldn’t come fast enough for me. Thank God for Amazon.com! I feel as if I’ve lost a relative and a good friend. My heart goes out to Mr. Craig’s family. Before him, I was (and continue to be) in love with Brady. I just received “One-Way Ticket” and can’t wait for November now! Cheers to all of the recipes and good times he’s afforded me! Having grown up on the New England shore and having discovered the J W Jackson series while living on a Caribbean island, I SO looked forward to finding his latest titles whenever I was stateside and am so VERY sad to hear that he is gone! (Of course, I have all his books.) He will be VERY MUCH missed– there really is hardly anyone writing as well today! (PS The smoked bluefish pate recipe works so well with flying fish, too!) A memorable man! I am so sad to hear about Professor Craig’s death — just read William Tapply’s “One-Way Ticket” and saw an “in memoriam” at the beginning. . . I can’t tell you how much I will be at a loss to have no more of J.W. Jackson and Zee. I especially loved the way Professor Craig wove in snippets of Gerard Manley Hopkins’ poetry — a way to keep Hopkins at the forefront when (I’m sure) many people know nothing of him. I once emailed him with thanks for these Hopkins references, and he offered a quick and gracious reply. And now I can’t help but think that it’s Margaret I mourn for…. Being a natural-born New Englander, (transplanted to Nebraska many years ago) I have read, with so very much pleasure, Philip Craig’s books. Today I was ordering the cookbook and discovered the news of his pasing. It was so much too soon. I had just picked up another JW mystery at the library and was so excited to read it! I love the stories, particulary since I come from Massachusetts. I was going to write to him on the website and discovered the sad news that he had passed on. My sympathies go out to his family and friends. We only knew his talent and that will be missed; We can’t know the measure of losing him as a loved one. Thank you for sharing him with his fans all these years. I just read “One Way Ticket” by William G. Tapply and was stunned to see his “in memorium” dedication. I am saddened that there will be no more J. W. mysteries. My condolences to his family. I just picked up “One Way Ticket” at the library and was saddened to see that the book was dedicated “in memory to Phil Craig”. I have read all the Phillip Craig and William Tapply books and loved every one. One of the places on my “must see” list of travels is to Martha’s Vineyard, due in part to what I’ve learned about it from the J.W. Jackson books. My sympathy to his family and to Bill Tapply on the loss of a good friend. He will be missed by many. Unfortunately, I too saw the dedication by Bill Tapply, “in memory of Phil Craig”. I was stunned and very saddened at his passing. I have been recommending him and Bill Tapply to as many folks as I meet who enjoy reading a good mystery. I’ve gone so far as to email one of my other favorite authors, Margaret Maron, to sample their work if she hadn’t already done so. My best wishes and condolences go out to his wife and family. I look forward to his last novel and am sitting with his last book with Bill Tapply, unable to start it yet, knowing it will be their last together. I met Phillip on the Vinyard almost 20 years ago. He was kind enough to autograph my book for me and point out that just because I had yet to get a book published, I should never give up. I always remembered his words and his kindness. In September, I published my book. Fare thee well, Phillip. You were a fine author … and a true gentleman. I just picked up William Tapply & Philip Craig’s latest “Third Strike” & learned of Philip Craig’s passing. I was shocked. A huge fan I started with “Off Season” in 1994 when my daughter,then 10 years old, spied it in a second hand book store & thought I might like it. I was a Martha Stewart fan at the time & the name “Martha” in Martha’s Vineyard must have caught her eye. His story lines, locale and characters all kept me reading until done. My ex-husband,also a fan, happened upon William Tapply, so we had another two authors to enjoy over the years we were together. I toast you with a potato vodka martini,J.W. and wish you bountiful castings for blues in a place where they never stop running. I am so sad to learn of his passing. An avid surf fisherman have just finished reading First Light, Wonderful. My birthday is tomorrow and am buying A Beautiful Place To Die as a birthday present. 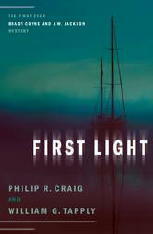 Have read 2 books cover to cover First Light being the second. Can’t wait to read the rest. God Bless the family may he catch all the Blues and Stripers he can. I just finished reading “Third Strike” after checking it out from my local library. My father turned me on to Philip Craig’s J.W. Jackson series in the early nineties and we looked forward to reading the new one each summer. My dad would buy it and read it first and then mail it to me to read. I contined to read his books after my father passed away and it was a thread to him and the things we shared in common. I found William Tapply’s books through their first collaboration in 2001 and I rapidly read all of his Brady Coyne books. I didn’t realize that Philip had passed away until I read the memorium at the end of “Third Strike”. I am very saddened to learn of his passing but happy to read on his website that there are a couple of new books to be released. I think that J.W. Jackson must surely have been his alter ego and I am sure he would have wanted to be remembered through this compelling character he created. One day I hope to visit Martha’s Vineyard to see the island so lovingly described in his books. I am saddened to learn of Philip Craig’s demise as I just found and enjoyed his newest book, Vinyard Stalker. I wanted to remind him that if the real property of the Monk was sold, the Trustee would not get the proceeds but the beneficiaries would. That was the only flaw in an otherwise tremendously enjoyable read. God bless Philip R. Craig. As usual, when I find a mystery writer that I enjoy, I make a list of all their books and work my way through them from first to last. It seems I had just discovered the joys of the “Vineyard” series last year when Mr. Craig passed away. My first thought on hearing the news was that with his absence, I’ve also lost Zee, her children, (including “The Huntress”), martinis on the balcony, Bozo at the Fireside bar, the treehouse — as he goes, so they go — the loss seems more poignant because we’ll never meet them again – I’m thankful I have a least a half dozen of his books left to enjoy. I usually read female authors – but Mr. Craig was a man’s man with a gentle touch. Thanks to everyone who’s left tributes to Philip R. Craig on my blog. This particular post remains the one most visited, nearly a year now after his death. His books have obviously struck a chord in a large number of readers, including me. It’s the characters as well as the location, but the characters first, that appeal to people, as all of the comments above have indicated. That there’s always a mystery involved is a bonus. The good news is that there is a final book in the series of their adventures. Here’s a review from Publishers Weekly. Coming soon! 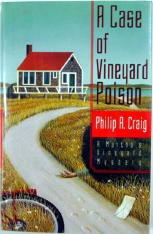 I just picked up the latest Vineyard mystery and was stunned to learn that Philip R. Craig passed away. I feel like I lost a dear family member. I could not bring myself to start reading the last book.I always knew that every time I started a J.W adventure, there would always be another one being written.My deepest sympathy to his family. I belong to the Travis McGee fan club, and one of the others mentioned PRC’s books. I started reading them and fell in love. I realize that this is impossible but I hate to fish but it seems I do not mind reading about the enjoyment J.W., Zee, and Brady get. I feel I have lost friends in losing J.W. and Zee. Luckily I still have Brady and have found Stoney. My heart felt and deepest sympathy to Mr. Craig’s family and friends. I was very saddened to read that Philip Craig passed away last year. My thoughts and prayers go out to all his family and friends. I have read many of Mr. Craig’s Martha’s Vineyard Mysteries as well as two of the books that were co-authored with Mr. Tapply, they too were very good. Mr. Craig’s series on Martha’s Vineyard brought to life for me a place I’ve never been, but hope someday to be able to visit! I’d been waiting for the usual June publication of the latest JW mystery and was thrilled to find it about two weeks ago. What a shock to discover that he had passed away last year! I felt as if Zee and her children had been widowed and I had lost a dear friend. Even though it’s been a year since his death, I want to offer my condolences to Mr. Craig’s family and friends. I hate it when my favorite authors die. It’s not fair. The enjoyment they offer the millions of readers should continue; because when it stops, our hearts are broken–both for the author who brought us the people we love (JW, Zee, the inhabitants of the island who weave in and out of JW’s life)and for the people in the stories whom we will never “see” again. I will miss them, and I will miss one of the most enjoyable yarn tellers of the mystery genre. Philip, thank you for the years of wonderful books. I am so very sad for Mr. Craig’s family and all of us who love his Vineyard mysteries. I recently requested his last book through the library,brought it home,and decided to wait a while more to read it. I will miss JW and all the terrific characters Mr. Craig brought to me and my sister who often pleaded with me to read his books first. Thank you Mr. Craig. I just now learned of Philip Craig’s death by seeing Tapply’s dedication of One-Way Ticket. What a loss! and I feel very sad, considering I didn’t actually know him. Writers and the characters they create affect us much more than they realize. My condolences to his family. I have lost one of my favorite authors who helped me to remember wonderful memories of the Vineyard.While reading I could pretend I was there. My condolences to his family. After living most of my life on the East Coast and having a vacation condo on Cape Cod, it was such a wonderful surprise to discover Philip Craig’s books after we moved to Seattle in 1993. With the first read, I became hooked and have purchased and read all of his books. Reading them became like an actual visit to the Vineyard and to JW and his family. I feel that I have lost a personal friend and he will be sorely missed. It is with great sadness that I send my condolances to the family of Philip R. Craig. I just learned a few weeks ago that Mr. Craig had passed away. I picked up his latest books at the library and saw “the late…” in the biography. What a shock! I have read every book over the years and the three in collaboration with Mr. Tapply. As an educator, I so looked forward to summer vacations and Philip R. Craig books! What an immense pleasure it has been to travel to Martha’s Vineyard and get lost in the lives of J.W. and Zee for a while. Mr. Craig, and his characters, will be missed. For a reason probably obvious, I buy and read books by “Craig” authors. I had to laugh out loud only a few pages into the first JWJ book saying, “I know we’re related because of his sense of humor!” We may or may not be related, but Philip’s sense of humor was surely parallel to that of my family. Interestingly, one of my brothers had never heard of Philip or his books, but was an avid fan of Tapply’s Brady Coyne. Needless to say, both of us became joint fans of both of them. Another pleasure (in recent years) was to follow JWs island excursions on Google Earth. I too did not know of Philip’s passing until reading the dust jacket of Third Strike. As an avid birder, I will miss his grumps about the Plovers. I’m very sorry to hear that he is no longer with us. I am great saddened by the death of Mr. Craig. I too did not know of Philip�s passing until reading the dust jacket of Third Strike only a couple of weeks ago. I was hooked on JW & Zee’s family life as much as the mystery plots & the description of the island. Though not a fishing guy at all, I enjoyed the descriptions. One day I hope to visit Martha�s Vineyard to see the island because Google Earth is far from enough. My belated yet warm condolences for your loss. Have just learned of Philip’s death in reading Vineyard Chill. I’ve really enjoyed reading 8 of his books and am looking forward to reading the remainder. He wrote engrossing stories. I just finished reading Third Strike and, as so many others, find myself in shock to learn that Philip Craig had died last year. I visited Martha’s Vineyard only once, almost 30 years ago, but have been able to travel back and explore and enjoy the island with J.W.,Zee,their children,and sometimes Brady Coyne.I have read all of his mysteries, including those written with Mr. Tapply. Though very late, my deepest sympathies go out to Mr. Craig’s family and friends in their great loss. Having lived on Cape Cod for 38 years and now being a “snowbird” living in Florida for the winter, I spotted Philip Craig’s last book, “Vineyard Chill” in my local Florida library and grabbed it. I immediately became involved with the characters and location and was so very upset to read that this was the last novel. I fully intend to start at the beginning and work my way back. My wish would have been to meet Mr. Craig at one of his book signings while on the Cape. Even though belated, my sincere sympathy to the family. belated sympathies, to his family. Like many others, after reading several of Phillip Craig’s books I decided to go on line and find out more about him. Now I am so sad. I feel almost as if I knew him and I do know that I liked all I have learned about him. I had been a fan of Wm. Tapply’s before I discovered Phillip and thoroughly enjoyed the books they wrote together. I have never been to Martha’s Vineyard or any part of New England and never will go there, I am sure but the joy of reading very good books from places I may never see brings me untold joy and Phillip Craig added much to my life. Several years ago I was fortuneate to attend The President’s Book Club at then Mary Washington College to hear Phillip Craig speak and meet him and Shirley. It prompted me to seriously start reading more. I just happened upon Vineyard Chill yesterday in my local library and was deeply saddened to learn he had died. through his stories each year and the DELISH recipes. I will truly miss his contributions to my world of literature. A frequent vacationer to the vineyard, I came across Phillip Craig’s books in the Edgartown Book store. Just before his death, I met him and Shirley at the bookstore where he was signing his books. Such a smile on his face and so easy to talk to. I have a library of his books. Now in the mist of reading Third Strike. So happy to have met such a wonderful man. Prayers to Shirley and family. I found a book in the library called the Vineyard series and started at the beginning. Not until I got to Third Strike did I discover Phillip Craig’s passing. I was just stunned. He reminded me so much of my husband who passed 6 years ago so I found myself crying late into the nightrather than reading this latest book. Now I will savor his last book, Vineyard Chill and again feel the loss. I read his web site and as much as I could and knew what a wonderful family he was. My sympathies go out to Shirley and family and know they are loved and being watched over from above. Well it is 2009 and I have just discovered that Mr. Craig died. I have read all of his books and every year I waited for another story. I was born in Mass. and I am of Portuguese descent so his books always thrilled me. He will be missed. Many prayers to his family. I am deeply saddened to learn of Mr. Craigs passing , his work has been a treasure of enjoyment for me over the years and I will miss him and JW . My heart goes out to his family and friends . I discovered Philip R. Craig’s mysteries barely a month ago, buying them one by one at a used book sale at a Senior Center in San Francisco, at recess from my writers’ group, and then filling in the gaps from the library. Like other bloggers, I just learned of his untimely death from the book jacket of Third Strike and feel personally deprived. My condolences to his family on their great loss. I just want to say For a 39 year old fisherman who hasnt picked up a book in twenty years. Thank you Phillip and god bless you You have brought enjoyment of reading a good book back into my life. Oh and not to mention some fantastic recipes. After visiting Marthas Vinyard last summer I plan to make an annual trip there even if it is just for a day 🙂 He will be missed and I plan to read every book. Thanks again Hope to see you some day. I was rereading Cliff Hanger and thought I would check out Phillip on the internet and found out that he had passed. I had the same feeling that I had when I learned of John D. MacDonald’s death. His books brought much joy to my life. I will miss him. Last summer I discovered the Vineyard series at the library. I started reading the books in order and really enjoyed them. I was so saddened to realize half-way through the series that Mr. Craig had died in 2007. I purposely read other books before the last two because I hated to have the series end. Now I am half-way through the last book and feel more saddened than ever that there will be no more wonderful Jackson family adventures. I am going to start reading the Brady Coyne mysteries as a substitute, but will always miss J.W., Zee, Joshua and Diana. Having lost my husband in Aug of ’08 also after a short illness, I can identify with Mr. Craig’s wife and what she has experienced. My heart goes out to her family. Thanks to Philip Craig for his wonderful literary legacy. I was saddened hearing about Mr Craigs death. He was the only author I had ever wanted to meet. 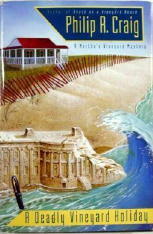 Visited Martha’s Vineyard years ago and love reading about places I remember. Now I am trying to collect all his books, on a retiree’s pocket book. But the library does keep me reading and re-reading these wonderful books. I discovered Philip Craig and Wm. Tapply at my local library at almost the same time, and was slowly working my way through both series when I read the memorial in Third Strike. I cannot begin to tell you how much pleasure the Vineyard series has brought to me and how much I will miss looking forward to a new book in the future. I am sad to lose J.W., Zee and the kids, the treehouse, drinks on the balcony, and yes, my pleasure at J.W.’s friendship with Bonzo!! My late, but very sincere condolences to Mr. Craig’s family. Just finished reading Vineyard Chill. Through the years, I had read almost all of the J.W. Jackson mysteries. But recently I decided to read them all in order. I had to use the Library on-line feature, including Link+ to get to the older novels. I read the oldest ones first, then, before I tackled 1st, 2nd, and 3rd Strike, I read Vineyard Chill. Imagine my shock when I finished the book and skipped past the recipes to read the Acknowledgements from Shirley Craig. I cannot adequately relate the depth of sorrow I feel in my heart. I’ve been walking around my house since I finished the book, in a daze. My husband and I used to live at the Plattsburgh AFB in N.Y. until 1976, and loved traveling all throughout New England. We spent our 25th Anniversary along Buzzards Bay, Block Island, and Martha’s Vineyard. (We’re up to 39 years now), so I always felt a close attachment to the Island when reading these books. I will miss new “J.W.” adventures, but I thank Phil for creating such a wonderful character, and an amazing series of books about this beautiful place. ‘One way ticket’ and saw the dedication to Craig. I was already mourning the passing of Robert Parker of Boston (the Spencer,Jesse Stone and Sunny Randall series) All my Boston area PI’s are gone, no more great books…so sad…. I have just received Third Watch. I have re-read most of his J.W. books since his death. I have put off reading Third Watch because it will be the last J.W. book for me to read. I so enjoy these books. What a talented writer. I have four writers whose books I keep. Mr. Craig is one of them. He is the only one who made me want to learn more about the setting of the stories. I have also tried recipes from the cookbook he and his wife wrote. YUM! I may not have anymore “new” J.W. books to read after Third Watch, but I will continue re-reading his books and cooking his great recipes. Thank you for your talent…it has brought me hours of joy. I was saddened to hear of Mr. Craig’s passing, I have been reading and collecting his books for several years. Everytime I am in a book store I look for a new one. I am now reading Mr. Tapply’s books and enjoying them as well. I will look for the books I have missed by Mr. Craig and order them online., My sincere condolences to his family, he will be missed. I picked up one of Mr Craig’s book because of our name. It was so much fun–until I got to the last only to see the word “late”. What a shock. My happy hours reading the Vineyard stories were over. Now I will read Mr. Tapply’s books. Hope they are as witty and happy (in spite of murders) as Mr. Craigs were. Just recently discovered the Vineyard series and am enjoying it immensely. I am so sorry to hear of Mr. Craig’s passing. It is rare to find stories written by a man with such a gentle touch and very entertaining. He will be missed so much. Better late than never. Just recently learned of Philip’s passing on reading Third Strike. I have read most of Mr. Craig’s books and thoroughly enjoyed each one, especially since my husband was a Boston policeman and we camped for many years on the Vineyard. I loved the cookbook also. Recently on a trip I met Cynthia Riggs, a friend of Philip’s and was graciously entertained in her home. Thank you Shirley for sharing your husband’s talent with so many of us and may God bless you and your family. Great writer, read all his books and will miss his writing. We started coming to Martha’s Vineyard around 1995. Every year I would pick up his new book at the local book store. I have read all of them including the ones you joined him on. Absolutely the best books I have read. I started to Reread them. My husband fishes and always keeps the blue fish to make JW’s Smoked Bluefish Pate. Everyone loves it! We haven’t been to the vineyard in a few years but now rereading these books we can’t wait to go back. It won’t be the same with out a new book from Philip but I will read and pass them all on. Wonderful. Truly missed!